The biggest difference between three-season and winter hiking is the walking surface. Snow and ice require traction aids such as snowshoes, microspikes, or crampons. Snowshoes provide flotation so you can walk on top of snow and not sink with each step, an exhausting experience known as post-holing. Microspikes and crampons provide extra traction for walking on ice. They take up where snowshoes leave off and many winter hikers carry both types of traction on day hikes or overnight trips into the winter backcountry. If you're relatively new to the winter hiking scene, you should probably buy a pair of snowshoes before investing in any other type of winter traction. In addition to providing flotation, modern snowshoes have metal teeth on their undersides, helping you to hike up hills on fresh snow or packed trails. Manufacturers such as Tubbs, MSR, Atlas, or Crescent Moon, offer a wide range of snowshoes that are designed for everything from recreational snowshoeing to full blown mountaineering. Read How to Choose Snowshoes for an explanation of the different types. 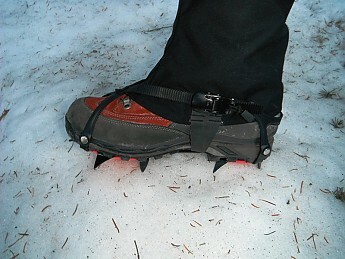 Many winter hikers also use microspikes for hikes that require scrambling over ice covered rock. Microspikes are a lightweight traction device with short cleats, attached to an elastic band that you slide over your shoes. Kahtoola Microspikes are a popular choice that are very durable and compatible with all types of winter footwear. While microspikes are great for walking on icy trails, they don't provide sufficient traction for walking on steep ice covered slopes. These conditions require crampons, a more aggressive traction device that has longer and sharper spikes and can penetrate into ice and give you a better foothold. You can choose among different types of crampons depending on your desired activity and the type of footwear you use. The general rule of thumb is that stiffer soled boots are required for hiking or climbing steeper, more challenging terrain. If you want to hike up steep hills and mountains with standard hiking boots, there are a number of different options available. You can buy strap-on crampons like the steel Black Diamond Contact Crampon or the lighter, but less durable aluminum CAMP XLC 490 Hyperlight. Strap-on crampons attach to your boots using nylon or plastic straps that loop around your toes and ankle. They can be used interchangeably with many different kinds of boots, making them an economical choice if you switch to heavier boots as the weather gets colder. If you plan to do general mountaineering or ice climbing with mountaineering boots, you want a step-in crampon like the Black Diamond Cyborg Pro or the Grivel G14. Step-in crampons lock onto heel and toe welts on the rigid soles of mountaineering boots, providing a more secure connection than a strap-on binding. Made out of steel for durability, these crampons are very heavy and often weigh more than one pound each. They can be dangerous to use without proper training, so don't use them unsupervised until you've learned how to use them safely. If you want to use softer shoes like trail runners in winter for trail running, racing, or simply because they're lighter than wearing heavy boots, you should consider some of the newer hybrid traction devices that are designed for less traditional winter footwear. For example, the Hillsound Trail Crampon Pro has two cm teeth that are midway between the one cm cleats found on Microspikes and the three cm teeth found on many step-in or strap-on crampons. They can be used with any style of boot and use a snowboard style, ratchet binding that is easier to put on and take off than a strap-on binding. The Kahtoola KTS Crampons, available in both steel and aluminum, also have two cm teeth. They are designed for use with trail runners, including an extremely flexible leaf spring connecting the front and rear parts of the crampon. Additionally, there are instep crampons, titanium hobnails you can screw into trail runners or hiking boots, and even snowshoes with removable crampons than can be worn separately to save the weight of carrying two separate traction aids. The problem of winter flotation and traction has obviously vexed humankind since the Ice Age! Now head over to Trailspace's snowshoe and traction device reviews and product descriptions and soon you'll be strapping on snowshoes and crampons at the first sight of snow and ice. I have recently purchased the Hillsound Trail Crampon Pro and I am anxious to them out. They are very sturdy and the ratcheting strap system works easily. The price was very manageable also. Despite requiring an allen wrench (supplied) to make adjustments, once made, there is no need to fidget with it unless you put them on a different pair of boots. 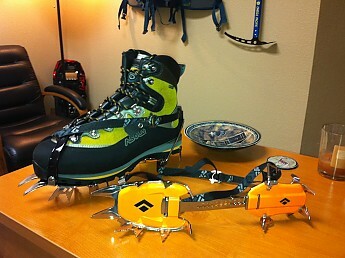 I am like yourself picked up som,e microspikes and I want to rent some snowshoes this winter and hit the trail . Can't wait for the white stuff and it should be heavy snows this winter here up east. IMO anything less than a full on crampon while backpacking over hard crust or ice is inviting trouble. You really don’t want to take any chances regarding obtaining the best possible traction in slippery surfaces in the backcountry. Even a gentle slope is sufficient for someone to build up scary speed should they fall and start sliding. Microspikes are good for parking lots and sidewalks, but the forces one generates on the trail shouldering a load can cause you to step out of devices held on by a rand (e.g. microspikes) or spikes of insufficient length can induce too much force into the ice, causing it to spall underfoot. Either way you'll be transformed into a flesh toboggan. hahaha a flesh toboggan, I like that one Ed. I completely agree with this 100%. Rob - I use a lot of different crampons and I like that Hillsound Crampon Pro a lot. It's a lot less dangerous than some of the super-sharp crampons I use with my mountaineering boots, and it works well with a softer boot. That ratcheting binding is really great - I think you'll like them. Ed is perfectly right on this, though I have no personal experience with an instep crampon. If the ice is hard enough that you need a crampon, you had better know what you are doing as a fall will be disastrous. Even if there is a good run out, as Ed says, you can get moving very quickly, and crampons themselves will be a danger, not just the threat of a wound, but if one digs in and you tumble. As far as sizing, I have to disagree with Phil a bit, as, depending on your boots and the crampons themselves, it may not be possible to interchange. As well, rigid skeleton crampons, require a very stiff soled boot, one that has at least a 3/4 shank, as flex of the sole will bend or break that type of crampon. An alternative is a hinged crampon, or a rigid crampon such as the old Lowe Fangs. Ed and Rick - I agree with you for hard, high angle ice but I think there is a role for microspikes in backcountry travel that you are unfairly discounting. They are perfectly fine for the 90% of the people who don't walk on high angle slopes and encounter ice on packed trails. I've hiked hundreds of miles in them myself, and the fact that they are compatible with any kind of footware, revolutionized outdoor winter hiking when they were first introduced because it meant that a lot more people could enjoy winter hiking. That's a good thing. I also often wear microspikes on packed out approach walks to high angle winter climbs (with and without a multi-day pack) to save energy. They are far lighter than snowshoes or full crampons, which is important when I need to climb 4,000 feet in a day and I'm wearing a heavy mountaineering boot. The key thing is to define your winter - many people have winters that don't involve backpacking on high angle mountains. I don't think it's useful to say that their gear or their goals are "wrong." Pardon me in advance if you weren't saying that, but that's what it sounds like to me. To me its all dependent upon how technical the terrain is and how large my pack load is. I will say for general trail hiking in icy conditions the Kahtoolas and the like will cut the mustard for most. I am really worried about footing for the most part. Especially when hauling 50 to 70lbs(winter kit for a week+) alone in the hills. This is another one of those scenarios where I use the "better to have it and not need it than need it and not have it" approach. Self preservation is a beautiful thing. 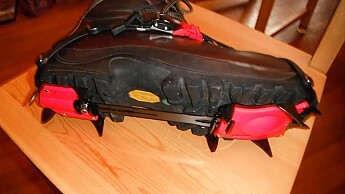 I used Yaktrax a couple winters in Jackson Hole WY. They work pretty well but wear out quite fast. 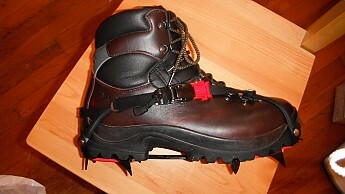 I have a pair of crampons like the red ones (name I can't remember) in the article post. These I have had three winters now and are still in good shape. Tho I dought I will use them here in Tucson unless I go up into the mountains. no, I hear you. I also like wearing those really beefy crampons. I feel like a superhero when I'm wearing them. I'm about 2 inches taller and nothing, nothing can stand in my way. I am not discounting anything. You don't need to be in alpine conditions to push the limits of microspikes. Even the loamy forest trails of the PNW have steep portions where they cross streams in ravines. Virtually every trail I have walked has some "crux moves" portions where the trail is a series of stair steps. The steps may be only slightly taller than the steps on your house, and only climb a "flight" five foot high; nevertheless that is the place where a slip can cause considerable injury. Likewise a gently traversing trail can have drifted snow covering the trail, in which case it becomes a side hill traverse which is steeper than the cleared trail, plus a side hill traverse in crampons is more difficult and more prone to slips, even with full sized spikes. Lastly there are many folks who tout the virtues of trekking poles, and the added stability they offer on trail. I am not one of those folks, but certainly if one can justify trekking poles on a dry trail I would contend the rationalizations for full on crampons on the same trail is a no brainer. Perhaps you have yet to have a mishap using microspikes. You may also be one of those lucky enough to have never been involved as a driver in an automobile accident. Note the key word is luck. Yet you probably have an insurance policy. There are threads that occur on a regular basis on this forum about proper preparation. 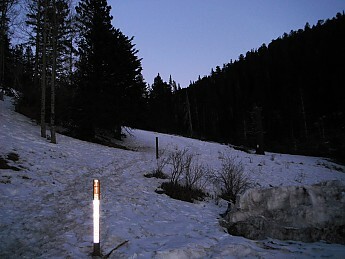 I have yet to know anyone who can tell me they KNOW the snow conditions based on what they see from the trailhead. Therefore I argue unless your walk is confined to a snow covered golf course, meadow, or perhaps the flatness of the great plains of the Midwest, stomping off on micro spikes in the backcountry while shouldering a pack is inherently more risky than heading out hoofing it with a full-on pair of crampons. All good thoughts. What I was trying to impart had to do with buying gear that can get you into trouble very quickly. On Baker once, I encountered a group of hikers, who obviously had some hiking experience, but had no technical climbing chops. They had outfitted themselves(or some one had) with crampons so they could get out onto the Kulshan glacier. Though the ice wasn't particularly steep, and I would argue, less intimidating than standing at the foot of a vertical rock wall, it still had dangers because of the angle, if not the crevasses. They were trying to front point, rather than French it on this low angle and I was afraid one would fall(they were unroped and no tools) and I'd ruin my week end having to rescue someone. Again, having no experience with instep crampons, I can see their point on low angle icy trails. As even a slight slope on hard ice, if you lose traction, can be dangerous, I think a word of caution is justified. A somewhat related aside to the dangers, happened on the Nooksack Tower some years ago. It was crusty and things were going well, until one of our party broke through with both feet. Unfortunately, he was standing at the time, and the second foot with a crampon point, went through his gaiter and dissected part of his calf. Crampons can inflict a nasty wound. Rick, I know you were joking, but in the mid to late sixties, even as I had rubber soled boots, I had read about tricouni nailed boots. So I found a pair of suitable leather soled boots, located some tricounis and the shoe repair guy actually had hobnails, and I gave them a try. Surprisingly, they work really well on rock, though mostly the edging technique that was the norm. Of course they were good on ice and just regular trail. Logs were not a problem and on heather slopes they were better than any rubber soled boot I've had. Walking into a general store that had VAT floor was huge mistake however. It was like walking in bicycle cleats. I don't have the experience of some here, but I am confident to face most conditions to be found while backpacking using microspikes. Knowing their limits, however, is very important. It is like anything else, they have thier pros, cons, and limitation: not knowing how to act accordingly can put you in some serious hurt. The Grand Canyon sells tons of cheap yet effective instep crampons in the winter (of course) As most of the trails have snow compacted into ice on the trails going down into the canyon from the rims. After about 200 feet the snow and ice becomes wet mud and another few hundred feet the trails are dry and dusty again. I think overall, the issue is not to exceed your abilities or the particular piece of gear's intended design. Ultimately the user must be completely aware of his/her surroundings and the conditions underfoot. Know that microspikes, yaktrax, instep crampon and such, which are great for icy sidewalks to trails won't work as effectively as a more sturdy design such as the BD Contact, Trail Pro or Kahtoola KTS when the conditions underfoot become more demanding. Also, where those crampons, KTS, etc., are great (trail and off trail), the user would exceed the design limits by attempting full on mountaineering and ice climbing instead of using a dedicated boot and crampon for those types of conditions. Are Instep Crampons preferable to the spikes? I know there is one day on my trek where it is typically a bit dicey and many blogs I have read, the people report wishing they had something on teh steep, rocky, icy path down. Of all the traction devices, instep crampons provide the least stability due to the singular area of contact from each foot with the ground surface. All the others provide points of traction spread out evenly across all areas of each foot. Yaktrax wear out very quickly. 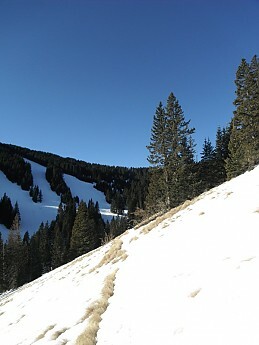 After traversing some considerable angle trails in the SoCal widerness, on snowshoes, Micro-spikes (borrowed) and without traction devices, I decided, after too-many close calls, to bite the bullet and get some BD Sabertooth semi-autos - arriving for Christmas and my winter trips above treeline coming up. Can't wait to try them and feel more secure about my trips. I like the semi-auto, stainless construction, included anti-balling plates, 14 points, micro-adjustable rear clip. Review to follow early 2012! I had considered in-steps, but to echo Gonzan's point (no pun intended) I'm not sure I'm comfortable working without traction at first contact landing points on descents (heel section of the boot) and ascents (forefoot of boot - also important for push off and rotation). Additionally most do not practice proper side hill traverse technique. As a result they end up with only two points of the typical instep crampon in contact with the surface, and that only when both toe and heel are contacting the surface. The basics are covered in Mountaineering: Freedom of the Hills, published by The Mountaineers Books. Reference the sections regarding French Technique. Or Google French Technique. Oh Yeah Baby! Can't wait to try 'em out. Just a heads up to anyone interested. I have the Hillsound Trail Crampon Pros in size regular at the moment. What pair will be dependent upon what works better for me but I have a feeling it will be the regulars that will be up for grabs though. Trailspace members will get first dibs and I will post in the classified section when I get back. Happy New Year! I was relieved to find in reading reviews that they'd fit my size 13 Asolos (barely) without extended plates (keeps the weight down). Adjusted to the last notch! I like that they came with the anti-balling plates. I considered the Hillsounds as well, but since California Glaciers are in the plans for Winter 2012, as well as some steeper climbs, I decided to stick with the more dedicated, but less flexible (in terms of fit to different footwear) Sabers. I personally am a big supporter of anti-balling plates. Those BDs look really nice. At least not for my use. They just don't provide the necessary stability for me. The chain setup on them adds too much play to the spikes and they have a tendency to feel like they are rolling from my experience. This can make for sketchy treading in steep terrain with a larger pack load. If I do a glissade I want it to be by choice. Its alot better than "pinballing" down the side of a ridge especially being I am almost always solo. I also scored some nice Komperdell Mountaineer snowshoes for Christmas. Can't wait to try them out on the 10k ridge here this month. Just need more snow! Yeah we are running into the same thing here. Pretty cold with somewhat strong wind gusts in the ridges. But not really much snow. Maybe a foot max in some places. Kinda pointless to haul in snowshoes. Plus the temps are supposed to hit the 40s on the weekend. I don't mind doing a bit of post holing as long as it isn't for 20 miles+. .."pinballing" down the side of a ridge.. It is no more fun done in the company of others. My slip was during a group day outing on a popular route in the local mountains above Los Angeles, about 1000' above the Sierra Club hut on Mt Baldy. I wasn't the only one to have slipped there; it seems this route has a substantial list of slips, including a few eminent climbers and a number of fatalities. A lapse in concentration at the end of a long day lead to slow reaction to a slip, a botched self arrest, and a 500' vertical uncontrolled “glissade.” I was caroming off boulders and ice berms all the while picking up speed, and losing equipment along the way. It was happening so fast I didn’t have the wherewithal to get afraid. Finally stopped after a plunge off a small drop drove me through the surface crust, arresting me in place. Very bruised and cut up, I was barely able to walk out the remaining mile or so, but had no significant injuries. Very lucky. The reason I mentioned the solo part is that at least if I had someone around they could pick up the pieces and call SAR for me. Solo for me is a different basket of apples. I may not be found for days dependent on how far into my trip I am. If I am 3 days in and still have 3 days to go I may not be looked for until after I don't make my pick-up. In the winter this could be the difference between me living to hike another day or not. I'm not much of a "risk taker" for these reasons. I see so many doing things in the colder seasons that just leave me scratching my head. I likewise like to go conservative on all solos no matter the season. Summer trips I don’t stray far from established trails, unless I can tag along with strangers I meet on the trail. I always leave a note back in camp to indicate my whereabouts, even if just fetching water. At least it gives SAR a starting point. Saying one uses a conservative approach to going solo in the mountains out west in the winter is a debatable contradiction. But I go anyway, limiting my itinerary to places I have been before, following route lines that minimize avalanche risk, and do not venture if the forecast indicates a impending storm front. I usually ski, but limit myself to shuffling for the most part, even if with others, as the back country is no place to break a leg emulating Warren Miller movie stunts. I leave a trip itinerary behind in both home and trailhead vehicle, but frequently must alters specific details due to safety considerations. The one thing that never ceases to amaze me is invariably I see tracks leading right across frozen lakes, or down a no fall chute. What are these people thinking? Well the XLs(Hillsounds) arrived and they seem to fit pretty good. Hard wood floors here I come. Philip(or anyone else) do you use the Alpine stoppers on yours? Rick the stoppers go behind the buckle. Photo from the Hillsound website. @Ed- I figured you would(know what I meant,) I just added that for others who maybe viewing this thread and are considering their first winter solo. @Rob-I know(see above photos) but are they really that much of a necessity? I have the regulars and they seem to get caught on the lace hooks on my Scarpas a bit when I am disengaging the the ratchet system for removal. My worry is that they may become a pain in the tail if they get caked up with ice etc and getting them off could become a daunting task. I have tried the regs with the stoppers on them just to see how they are. I haven't really buried them or subjected them to extended use where they could get gunked up though. Oh well, I will put them through their paces starting here in a few days and see what happens. Rick, I wouldn't think so but I haven't tried them out yet. Maybe in deep conditions or postholing, I suppose snow could build up in front of the buckle and cause it to loosen/release. Maybe there have been complaints to Hillsound about that happening. @Rob-I'm not sure. I am not so much worried about the actual release getting jammed up based on the design and my prior years of using snowboard bindings. My though is that if subjected to long term snow/freezing temps that the stoppers may get jammed with crud/ice and one may not be able to release them. I will have to look into this further. It does say that that they can freeze up at -50 on the box but if I run into those kinds of temps here I have alot more to worry about than my crampons freezing up lol. I would rather have a well thought out system of how to deal with this if it happens as opposed to them freezing on the trail, and I have to come up with an unexpected fix. Oh I know alot of people talk about the Allen adjustment on the Hillsounds and having to keep the wrench with ya. Just keep it in your first aid kit and its always there and it takes up very little space. If you look in my first aid kit you will find all kinds of fun stuff. RJ Secor, well-known author of climbing guides to the High Sierra, the Mexican Volcanoes, Denali, and Aconcagua among other places) is one of those eminent climbers who slipped there. I see him every so often (according to RJ, Mike Sherrick and I taught him how to climb when he was 16, and I took him on his first multipitch climb, the Ski Tracks at Tahquitz). He suffered significant brain damage, which still shows up in his speech. IIRC, he was planning to glissade intentionally down from the Baldy summit ridge, but lost control. 1. Instep crampons are an invitation to sure death, or at least serious injury. 2. YakTrax and other spike devices are good when walking across an icey parking lot that is fairly level (or when walking from the Ilyushin to the Patriot Hills basecamp or to the vans to take you to the Union Glacier basecamp), but are poor on summer hiking trails that are iced over. They are in no way a substitute for proper crampons for approaches and peakbagging in winter. 3. 8-point and 10-point crampons, properly fitted to suitable footwear are adequate for winter approaches and winter peakbagging, as long as the slopes are no more steep than a standard black diamond ski run, but not on water ice. There are models available for winter marathon, 100k, orienteering, rogaine, and other similar running events that will work with suitable trail running shoes. 4.The "crampons" on some modern snowshoes are reasonable on moderate snow slopes, hard neve on moderate slopes, and glacial ice on moderate slopes, but only on fairly level water ice. The MSR snowshoes with the "full surround" toothed frame will go up water ice up to about a 60% slope if you raise the bail and have practiced a lot on lesser slopes. 5. hard neve, glacial ice, and water ice really require 12 or 14 point crampons. Aluminum crampons, such as the Grivel Air Tech, are reasonable for occasional approaches and even short frozen waterfalls, plus are as light as YakTrax and their relatives. However, they do dull quickly. Steel, and particularly stainless like many of the current Black Diamond, Petzel, and Grivel, are best for long-term use. 6. It is best to use step-in crampon "bindings" with boots made especially to take these (welts both at the toes and heels). Second best is the "Newmatic" style that have a toe bail/cup and a lever for the heel welt. Significantly poorer and prone to falling off are the all-strap (leather or fabric) bindings. 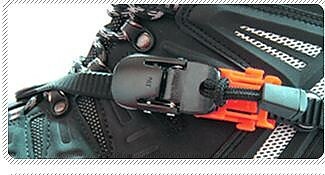 The "running" style crampons use these bindings, with most needing re-tightening every couple of miles. I won't go into the questions of vertical vs horizontal, single vs double front teeth. But I will recommend going with the adjustables. Footfangs are great, though pretty much unavailable except for collectors. The old forged type are also collector items that were made to fit a particular boot. I just realized what you meant. I hurried up and slapped them on to fire out a pic when I initially posted the first response w/o thinking. I'm such a goof. Thanks for the heads up Rob. I have been having alot of trouble sleeping lately(lucky to get 2hrs a night.) Hopefully a week on the trail will fix that. Not too mention I have never used the stoppers when I was testing them out just to get the feel of them. Guess this is one of those times when I should have read the instructions lol. Beauties Rick - I'll be lookin' for that review! Well, I've tried out the Trail Crampon Pros and they did well. The only issue I came across was with the Alpine Stopper which is supplied with the crampons by Hillsound. My issue was, I forgot to pack them! It wasn't really an issue until I started postholing around 11,000 ft and the buckles would loosen. Oh well, live and learn. Aside from that, once they were cinched down, there were no problems with the crampon sliding around on the boot. They stayed in place. The allen bolt did not loosen up either. They really bit into to ice and stayed put. No issues with snow buildup thanks to the anti-balling plates. I was having a heck of a time in the deep snow. 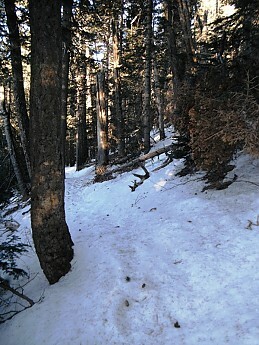 Fortunately, I located snowshoe tracks and followed them for the rest of the way up, which was better than postholing. I was wishing I had some snowshoes after that point. I have found this to be a great way to keep track of the stoppers and not misplace them. I ran into an issue with the crampons losing their adjustment. The allen bolt would cake up with ice and loosen up. This happened maybe 3 times on the whole trip. I would notice when I looked down at my feet and the forefoot portion of the crampon would be shifted a bit to the left or right. Rick, that's a good idea. I'll set 'em up that way so I won't forget the next time. I was cursing myself every other step when I started hitting the deep. Plus if they are on the inside of the buckle there is noway to lose them unless you lose the whole crampon. Rob, did you get carry bag with your pair? The regs I bought came with a bag but no stoppers and the XLs I just purchased came with stoppers and no bag lol. I emailed Hillsound and they said they stopped providing the bag due to increased cost. Ironically, I had an old Skiing Magazine fanny pack I received free with a subscription 10 years ago and it works well as a crampon bag. ..The only issue I came across was with the Alpine Stopper which is supplied with the crampons by Hillsound. My issue was, I forgot to pack them!.. Preclude a second problem - somehow losing them mid trip - by carrying extras of any component of your ice equipment that can be removed from the apparatus, or is subject to breakage. 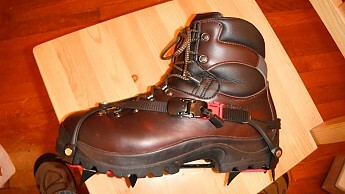 IMHO, a rigid 10 or 12 point crampon with a full-on mountaineering boot is overkill for winter hikes. For anything where you might have no choice but to front-point, such as ice climbing or glacier travel, that kind of rig is absolutely necessary, but not a lot of people are doing that all the time. I normally use Camp Stalkers, a semi-rigid steel 12 point that I can wear with my usual winter hiking boots, and they'll get me up any hill or an icy trail with no problem. I can even front-point a bit if it's steep, and I'm not carrying all the extra weight of a mountaineering boot and rigid crampon. And they even come with a bag! In deep snow, I'd rather wear snowshoes, and for an icy trail, or on an ice walk at the bottom of a frozen canyon, Microspikes are more than adequate. In fact, the commercial tour companies lend out those little rubber things with carbide tacks on the bottom to the tourists. Their clients aren't going anywhere except up the canyon, but those little sidewalk spikes work fine for that purpose. The key here is suiting the tool to the job. 25 cm (10") of fresh snow expected tonight at Nordegg, and when I go there on Friday I'll be bringing Microspikes, MRS Denalis, crampons, and even a pair of those cheap Stabilicers. For someone with no traction at all on an icy spot, even a little bit of metal on the bottom is better than nothing! PS: I agree that an instep crampon is just asking for trouble. I used a pair of crampons in size 16 in Alaska last summer and was happy that a tall and big outdoor retailer is providing stuff like that.